DEVIANTS: Featuring Hard French and Honey Soundsystem! It’s our favorite time of year – Folsom Street Fair! For the second year in a row we are partnering with the boys of Honey Soundsystem to bring you 12 hours of non stop partying. 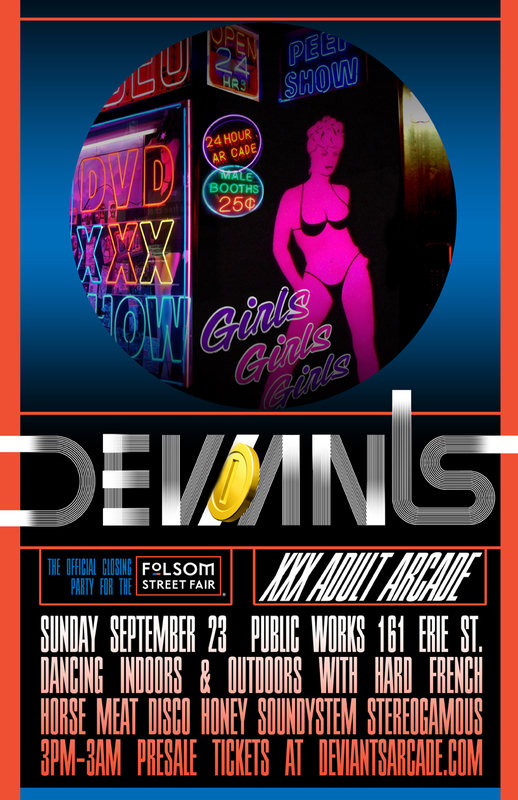 After admiring all the adult babies, human manimals, naked MENZ and public flogging at the fair, stop by Public Works for DEVIANTS ADULT ARCADE. Beginning at 3pm the entire block of Erie Street in front of Public Works will be transformed into an open-air dance party complete with Hard French’s signature all 60s soul sound, our infamous Jiggalicious Dance Babes, outdoor bars and food carts. In addition to resident DJs Brown Amy and Carnita, DJ Wam Bam Ashleyanne will be joining us for NONSTOP HARD FRENCH DANCING FROM 3pm – 10pm! What else can you expect? Stereogamous, a production duo based out of Sydney, Australia will be DJing and playing some songs with live vocalist Shaun J. Wright in the Public Works loft from 9-midnight. They have remixed some amazing acts and their music is best described as music for making out, horizontal dance music and BATH HOUSE. They have remixed the following bands: LCD Soundsystem, MEN, The Presets, Kylie Minogue, George Michael, Light Asylum, and more.. Horse Meat Disco will be DJing the main room of Public Works from 11-2am. Horse Meat Disco is dedicated to the industry of human happiness and it pumps it out every Sunday at THE EAGLE LONDON (formerly South Central). Its the queer party for everyone; Homos and Heteros, club kids, bears, fashionistas, naturists, guerilla drag queens and ladies who munch. Funky House Party MUSIC! ← HARD FRENCH HEARTS TRANSFORM SF!